Tank Details: 20 gallon tall. The Fish: albino corydoras catfish - 1, dwarf gouramis - 2, kissing gouramis - 2, flame gourami - 1, tiger barbs - 2, red-tailed shark - 1, "slender" or "black-tailed" hemiodus - 1, mystery snail - 1. 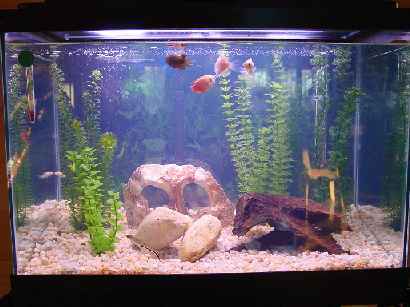 Comments: Power filter, full hood, plants artificial (starter tank).